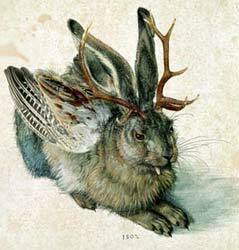 The Wolpertinger is a cryptid supposedly living in the alpine forests of Bavaria in Germany. 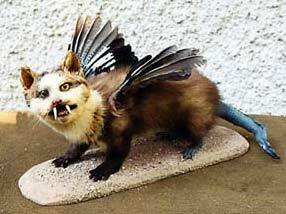 It has body parts of various animals, wings, antlers and fangs, all attached to the body of a small mammal. 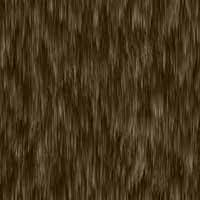 The most widespread description is that of a horned rabbit or horned squirrel. Stuffed Wolpertingers, composed of parts of real stuffed animals, are often displayed or sold as tourist souvenirs in their "native regions". 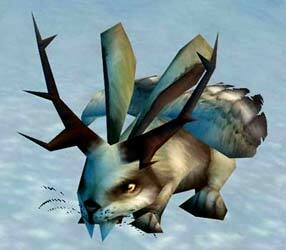 Each village has its own set of tales about sightings of the Wolpertinger in the nearby countryside. Like the jackalope, the Wolpertinger is thought to have been inspired by sightings of wild rabbits infected with the Shope papilloma virus, which causes the growth of antler-like tumors in various places on the rabbit's head and body. 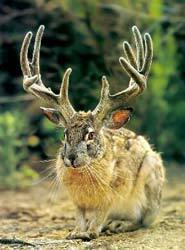 The jackalope is said to be a cross between a jackrabbit and an antelope (hence the name) and is usually portrayed as a rabbit with antlers. One common southwestern species of jackrabbit is called the antelope jackrabbit, because of its ability to run quickly like an antelope.